Make sure the surface the label will be applied to is clean, dry and free of any surface contamination such as dust, oil and rust. Use a cleaner such as Isopropyl Alcohol or a mild detergent. When the label is applied, use firm pressure to increase the physical contact of the adhesive with the surface. You want the adhesive to flow onto the surface. Time will increase the labels adhesion. The force required to remove a label is dramatically increased even after 24 hours. The surface temperature should be a minimum of room temperature. This allows the adhesive to ‘flow’ more readily, increasing the surface area, and increasing the adhesion peel strength. Avoid low surface energy plastics ie, Polystyrene, Tedlar, Polyethylene or Polypropylene. Metals and high surface energy plastics, ie, Nylon, Polyester, Epoxy paint, ABS, PVC will work great. Try sample labels on your surface to confirm compatibility. 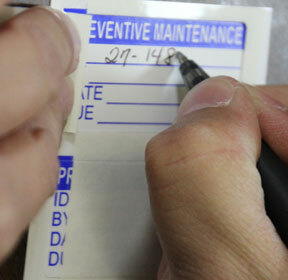 Contact us and we will be happy to provide labels for your testing. 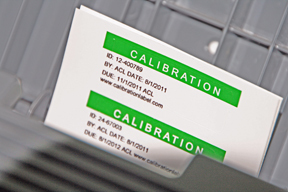 The QLL labels come in a sheet of 8 labels, about the size of a #10 envelope. Separate covers are oversized so they will completely cover your label. You can use label printing software (we use NiceLabel) or even Word with mailmerge. We have a simple word document and mailmerge file you can download to get you started. Use a printer with straight paper feed. Apply the covers after you have put the label in the instrument. 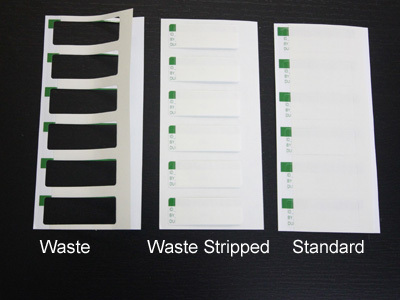 Do all your testing with plain paper to avoid wasting labels.